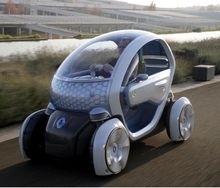 Renault and Daimler could develop a platform for Smart and the Twizy, shown. MUNICH -- Renault SA is in talks with Daimler AG and other companies about partnerships, the French carmaker's Chief Operating Officer, Patrick Pelata, said. Pelata's comments came after Daimler CEO Dieter Zetsche also said his company is talking with Renault and other automakers about joint projects. Daimler is seeking a partner to help it expand the Smart city-car brand and to jointly develop engines for its Mercedes-Benz B Class and other compact models. Renault is looking for a tie-up for a future range of low-cost city cars. Pelata said Renault's discussions cover various areas of possible cooperation including engines, transmissions and platforms. "Yes, we are discussing serious matters with Daimler," Pelata told journalists on Thursday. "Carmakers are holding discussions with each other. There are a lot at the moment." He added: "We're in talks with at least someone on all subjects." Automakers are seeking new partnerships and alliances to cut fixed costs and boost volumes as the car industry tries to become more efficient as it emerges from a deep crisis. Pelata said that during the global downturn, carmakers "try to share the costs of access to new technologies, like the electric vehicle, batteries, fuel cells -- anything that is very expensive ... and which is a fixed cost but which they don't want to abandon because they think these technologies could be necessary in the future"
A partnership, which could take in small car platforms or electric vehicles, would be "more positive for Daimler than for Renault, given their relative size," Credit Suisse analyst Stuart Pearson said. At the center of a Renault-Daimler tie-up would be a new rear-drive platform being developed by Mercedes-Benz engineers for Smart, AutoWeek, Automotive News Europe's sister publication, reported in November. The platform will underpin the third-generation ForTwo due in 2013 and a new four-door Smart with sliding rear doors. The platform would be modified by Renault for a range of low-cost cars including a two-seater based on the Twizy concept car unveiled at the 2009 Frankfurt auto show as well as a four-door similar to the show's Zoe concept, AutoWeek said. Mercedes and Renault also will share development of engines. In the first stage, Mercedes will provide Renault with a new three-cylinder direct-injection gasoline unit and a three-cylinder common-rail diesel, both with fuel-saving features such as stop-start and brake-energy recuperation. In the second stage, Renault would cooperate with Mercedes to develop sub 1.8-liter four-cylinder direct-injection gasoline and diesel engines for the Mercedes A- and B- class cars, Smart ForFour and future Renault models. Zetsche told Germany's Auto Motor Sport magazine on Nov. 14 that Daimler likely would announce a partner in the first half of next year. Zetsche said Daimler is speaking with other potential cooperation partners besides Renault. "It would be sensible to develop components with another automaker for cars below the C Class to increase volumes,” Zetsche told the magazine. "We're exploring possibilities but not only with Renault." A Daimler spokesman said: "We speak to various manufacturers, including Renault, about possibilities to cooperate."